Okay guys, this one is life changing. I am not kidding. 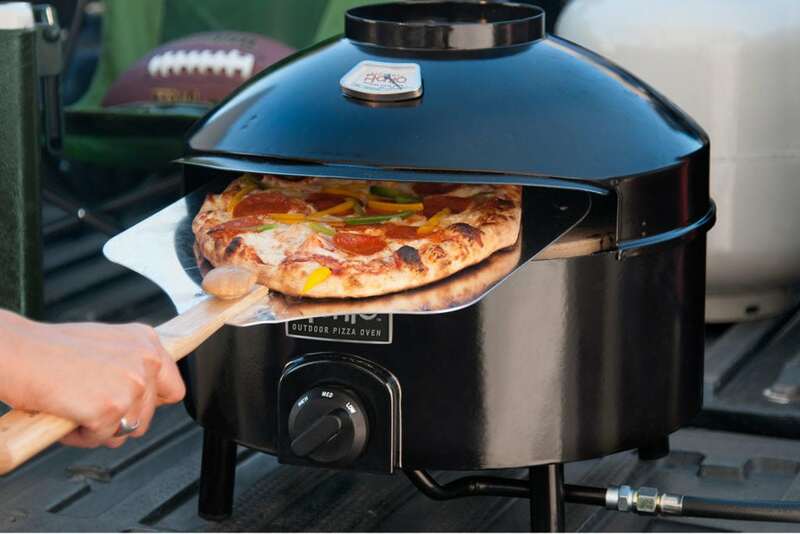 I can just barely contain my excitement long enough to tell you about my new favorite thing–the Pizzacraft Pizzeria Pronto Outdoor Pizza Oven. Whoever thought this up should be enshrined. Pizza is my favorite food. But, where I live, I can’t get a decent pie. Recently, on a trip to Denver, we must have had pizza for half our meals because it’s so good there. We’ve tried making pizza at home before, but it’s never that great. Until now! Holy cow, our at-home pizza is now way better than anything we can get out. And–we control the ingredients, using quality organic stuff. So not only are we getting a better tasting pie, it’s organic and healthier for us. Before the Pizzacraft Pizzeria Pronto, we were eating Trader Joes organic pizzas. 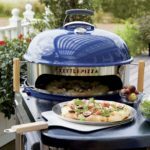 They’re great for a frozen pizza, but how do you go back to that after tasting professional-grade pizza at home? You don’t have to, because this takes very little effort. We must have made at least 20 delicious bubbly pizzas since getting this a week ago. It’s so fun. We play the “Italian Dinner” music mix on Spotify and we relish in the creative process of making pizzas and hanging out. We’ve tried all sorts of combinations and ingredients, like vine ripened organic tomatoes, kalamata olives, broccoli, fresh mozzarella, lemon zest (a recent discovery–it’s wonderful with ricotta), fresh basil, and your regular red sauce. I ordered some special flour to learn to make my own pizza dough, but for now we’ve been using Trader Joe dough. Make a big salad so that you eat more salad than pizza and you will be okay. Amazingly, I haven’t gained weight, but I think it’s because of the salads. Also, I’ve got to have salad with my pizza, it tastes better that way. A tangy green salad, or hearty kale goes great with pizza, and I like changing the salad ingredients and dressings to compliment various pizza toppings. 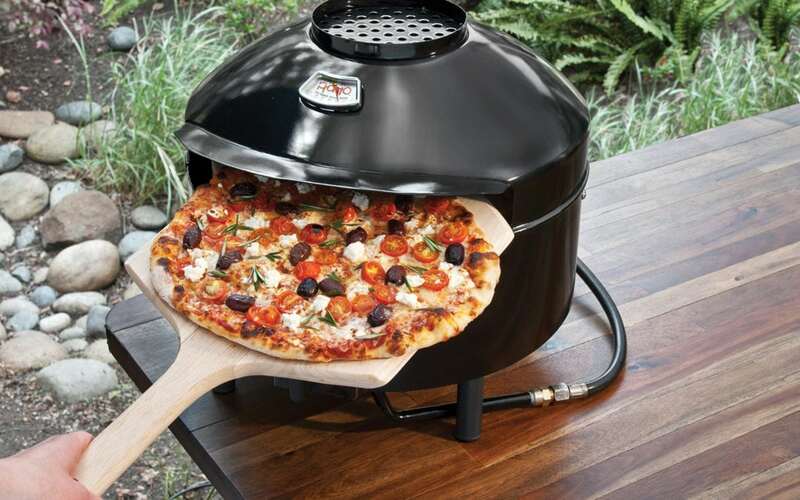 You need a pizza peel. 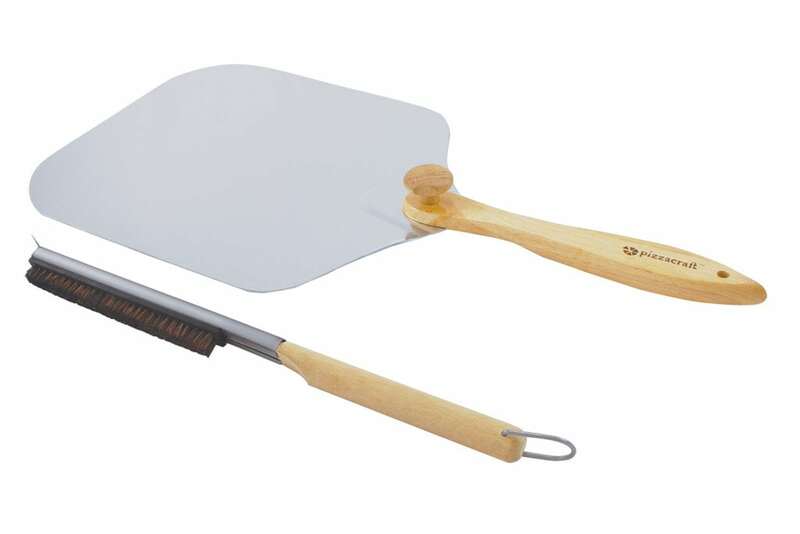 This Set from Pizzacraft is perfect for the job, the folding peel is sturdy and easy to store and the brush helps you keep the stone clean. We created the pies in the kitchen, on the flour-dusted peel, then gently transferred them into the oven. 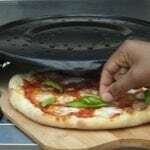 The oven goes up to 700 degrees and has a gage so that you can monitor the temperature. 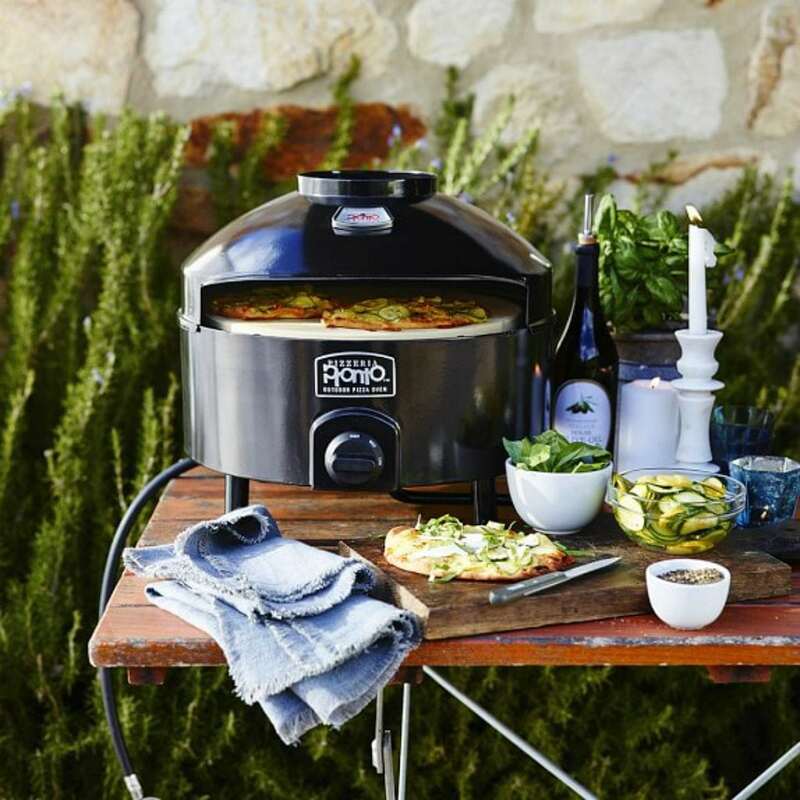 It only takes five minutes to cook a pizza. My 12 year old had a blast making his own pizzas. He made them like a pro from the get-go. 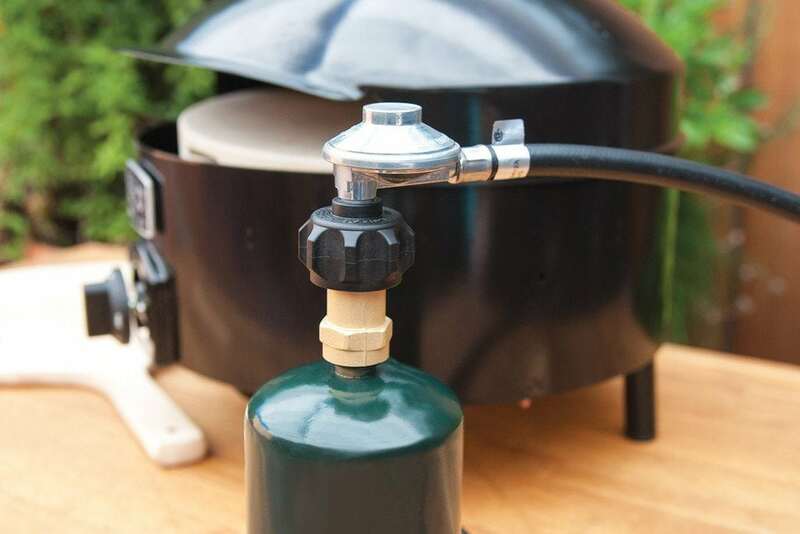 The adapter you need for the small propane tanks that you use for camping doesn’t come with the oven, so be sure to order that when you order the oven to use it while camping. 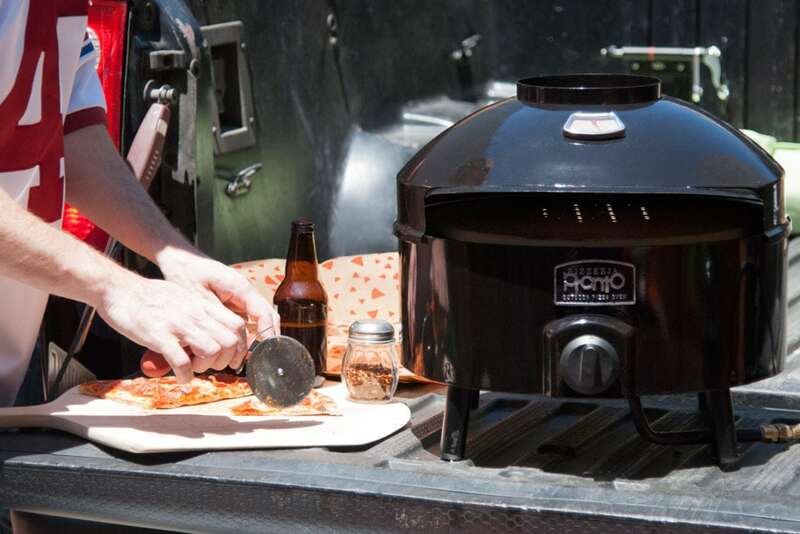 When we got our oven, we couldn’t wait to try it out, so we went to the grocery store and picked up a big propane tank. I’d never used a big one before, but it was as simple as screwing the hose onto the tank. Set up for the oven itself is very fast, you can see how that works in this video. Basically all you have to do is attach the feet and propane hose and add the stones. 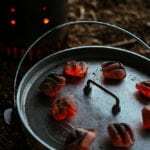 I set the oven up on our porch, on a camp kitchen (soon to be repeated at the campsite). 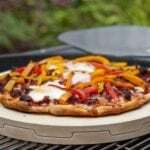 Within 15 minutes we were eating fresh homemade pizza, it’s that easy. I can’t wait to make it camping and I thought of waiting to show you camp pictures, but I want you to know about this now so that you can get equipped before summer. 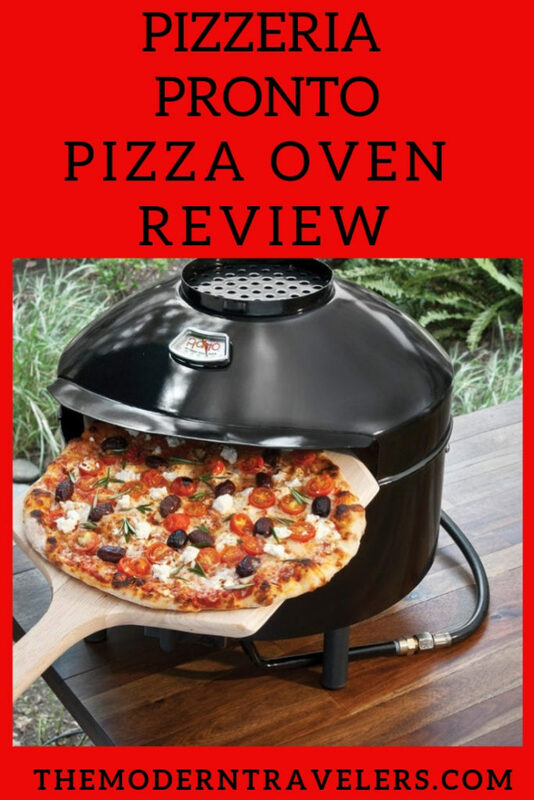 I’m telling you–if you love pizza, you will go crazy for this. I’ve never had so much fun making food in my entire life. How have I lived without this all these years!? 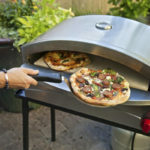 Find the Pizzacraft Pizzeria Pronto Outdoor Pizza Oven HERE.